High Quality Content by WIKIPEDIA articles! 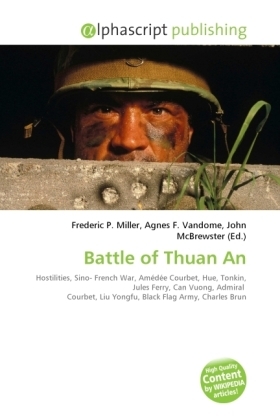 The Battle of Thuan An (20 August 1883) was a clash between the French and the Vietnamese during the period of undeclared hostilities which preceded the Sino-French War (August 1884 to April 1885). During the battle a French landing force under the command of Admiral Amédée Courbet stormed the coastal forts that guarded the river approaches to the Vietnamese capital Hue, enabling the French to dictate a treaty to the Vietnamese that recognised a French protectorate over Tonkin. The French strike against the Vietnamese in August 1883, sanctioned by Jules Ferry's administration in Paris, did more than anything else to make a war between France and China inevitable, and sowed the seeds of the Vietnamese Can Vuong national uprising in July 1885.